I hope you all enjoyed Mardi Gras weekend and were able to top it off with a Presidents' Day holiday Monday. Now with March right around the corner we've got St Patrick's Day to look forward to. And let's not forget Spring. I must admit, Springtime in California is simply the best time of year. Make sure to mark your calendars for March 11th Daylight Saving Time Begins - Spring Forward. And with the nicer Spring weather we always get some great car shows, so let's look ahead at what we've got coming up. On Saturday March 17th (St Patrick's Day) is the 8th Annual Highland Ave Auto Show at the Highland Ave Community Church, 9944 Highland Ave, Rancho Cucamunga from 9 am to 2 pm. The show will include food, music, raffles and a kid's zone. I would recommend this as a great show for anyone just starting out as a car show participant. For more info on this show or if you are interested in participating you can go to their website at www.highlandave.org. On March 31st I've got a really fun show for you, the Rockabilly Festival at Pitzer Collage in Claremont from 11 am to 6 pm. The show is hugely entertaining with live Rockabilly bands, a large car exhibition and art vendors. If you are interested in participating in this show you can email them at lsulsurockabillyfest@gmail.com. And as we take a look into April, we have on Saturday April 7th the Cool Cruise in Old Town La Verne from 9 am to 3 pm. The show will feature Customs, Classics, Hot Rods, Trucks and Muscle Cars. Dave McClellend will M.C. the show and classic rock 'n roll live music by The Answer. If you would like to register for this show you can contact Doug Lorimer at (626) 332-1155. I will, of course, keep you updated with any other shows coming up and would love to hear from you if you have an event coming up that you would like to promote in our newsletter. 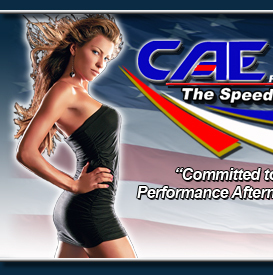 You can email me with all of your event info at caeperformance@aol.com. If you are on facebook, please be sure to check out our fan page, The Speed Shop, for great pics and videos from recent events. If you know someone who would also enjoy receiving my newsletter please refer them to our websites home page at www.caeperformance.com and they can enter their email address and they will be added.